Not really... the biggest gripe anyone here has had against Vestax is that they are usually overpriced compared to other heavey hitters like Urei and A&H. Sound or build quality is not contested too often. Last edited by nitred : 04-07-2011 at 03:05 AM. I said I would keep you posted and things have moved quickly in the last few days I bought Vestax PMC-500 off ebay for £550!! I was a bit unsure of bidding on it as it seemed to good to be true so i mailed the guy and he called me back and said i could collect it from his house and pay cash....luckily he only lived an hour and half away. He was a sound guy and got the mixer cheap (about £750) through a friend who works at Vestax so he didn’t seem to bothered about loosing a bit on it. He's changing for a DJM800 because of the 800's midi facilities - he's into his Ableton etc. The mixer is spotless and just like new so its was an absolute bargin!!! Ive price up a rotary kit and its about £125, so ive done really well out of it, if i sell my my Emapth it should cover most my costs. Ive spent a few hours on the mixer and so far I’m very impressed with the features and the sound quality. I actually had borrowed a Xone62 off a friend to try and i think the 500 sounds better? 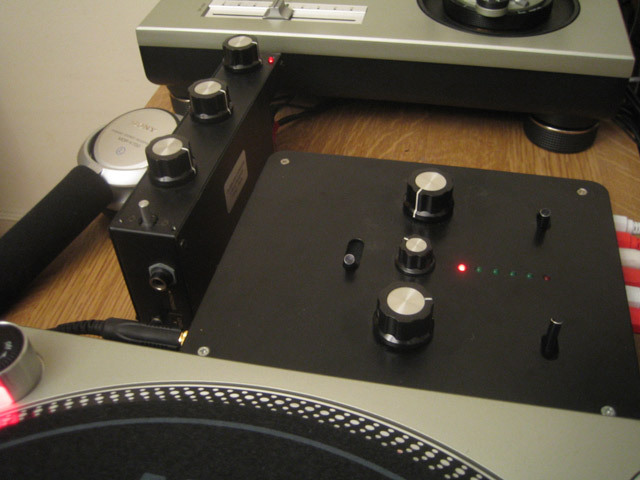 My only complaint is that all the knobs and sliders are a bit stiff bit but i thinks thats because its hardly been used and Im sure they will loosen up a bit with use? Thanks to everyone whose offered their advice its been a help. I'll post some pictures later on……sorry to waffle on!! Last edited by minpud : 04-26-2006 at 04:58 AM. Here's one of my designs. That's really nice. No question. I've made a couple of them. Some are fitted for DJM-500's others for standard 19in mixers. 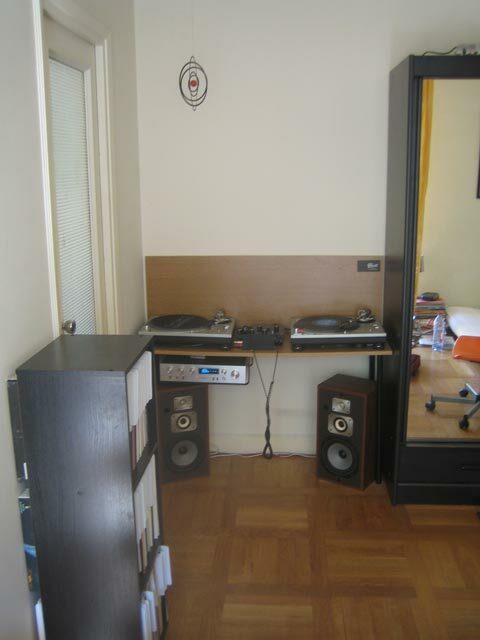 Ive got one that I can add wings to that hold either another deck or CDJ-1000's. I'm building another one, but I want to keep the CDJ's closer. Do you guys have a prefernce on how far they can be from the mixer, the current version is set up CDJ, TT, Mixer, TT, CDJ. Also I have to make another one that will be used by both battle Stlye D.J.s and normal setups. I'm a bit stuck since I usually flush mount the decks. In the current console the D.Js are pulling the decks out and setting them up battle stlyle. Some complain that they can't mix any other way! I Have a DJM-600 and a RANE rotary that I could use but I don't want to build anything if they are just going to complain about it. Any Thoughts? Really nice job! fiberglass over polyurethane foam may i guess/ask? Not nearly that advanced. It's made from MDF& Plywood. Doped with fiberglass resin and the mixer section is resin and Fleece. Oh ya a whole lot o' bondo (body filler). There is suspension too. I have done prototypes with everthing from rubber bands to hydraulics. I am using a rubberised foam now. It seems to be the only thing that will absorb a bump and won't feedback. As far as why one deck is lower than the other.. I screwed up in measurments, and one deck has the legs screwd up. Vinyl Touch Classic Technics 1200 equalizer. I figure I'd stick a pic of some of my stuff here. Like the ghetto light show. Last edited by NeverObsolete : 05-18-2006 at 08:14 AM. Is it weird to have those people line dancing all the time? 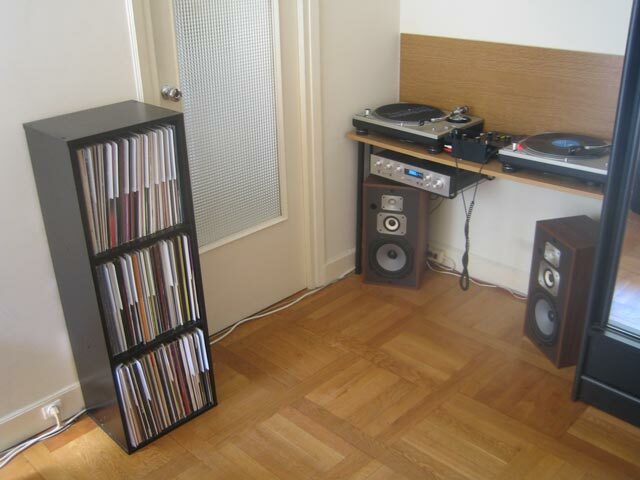 Do you mix with your speakers on the floor like that? Last edited by Richi : 02-02-2011 at 06:11 PM. That table doesn’t look straight dude, it looks like it’s slightly curving in the centre. 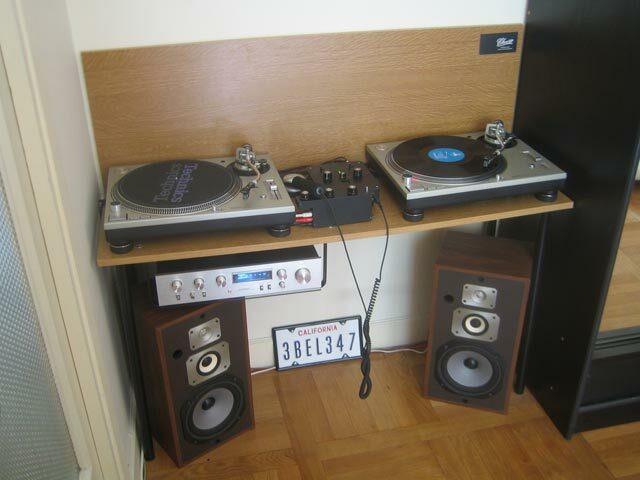 I think u should get one of those cheapy Computer desks and put the decks and mixer on there (That’s what I use and it looks ok plus it will give you some extra storage, cost me £50 from Argos) as for speakers it’s a difficult one, If I was in your shoes I would have a shelf above the desk head height and put some smaller speakers that are front ported or if rear ported have bungs in the ports. But this is not an ideal situation. Considering you are a renter I don’t think they will mind an innocent book shelf but if you tell them I need to hang my big fuckoff party speakers they will say no but to a book shelf ohh yes..